Hi, In this guide you will find how to enable developer options and debugging on Android 4.2 or upper of Android OS. 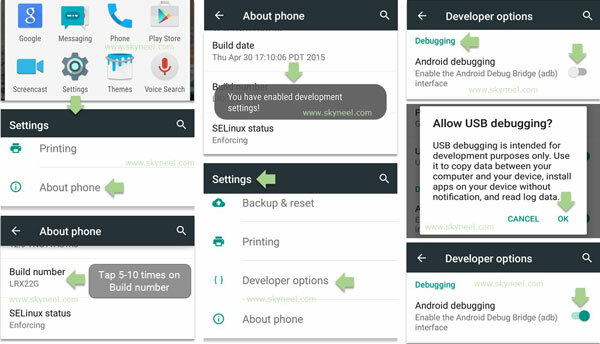 This is a very simple, safe and easy step by step guide tutorial for enable developer options and debugging on Android 4.2 or upper version with image guide. Developer options not enable by default on Android 4.2 or upper of Android OS. You need to enable Developer options for the enable debugging mode and protect your SD card etc features. If you want to update your ROM and root your device then you must be enable debugging mode for safe side. After enable debugging mode, if your Android device is damage while updating or rooting process then you and your device manufacturer company service able repair your Android device. So here we go to know How to Enable developer options in Android 4.2 or upper version. Step 1: First of all open App menu on your Android device then go to the System setting. Now scroll down at the bottom and tap on the About phone tab, then scroll down and find Build number tab. Now tap on Build number tab 5-10 times continue, then you will get a popup massage “You have enabled development setting”. Now you have enabled Developer option tab on your Android device. See in this image. Step 2: Now go back to the System setting and scroll down to find Developer options tab, when you find Developer options then tap on the Developer options to open it. Now find Debugging section and enable Android debugging or USB debugging. You will get a popup message, then tap on the OK. Now you will Android debugging enabled. See in this image. I hope you like this update guide from which you will be able to easily enable developer options and debugging on Android 4.2 or upper version without any extra efforts. If you feel any kind of problem in this guide then please use comment box. Kindly, follow all these given steps carefully and share your knowledge with your friends, colleague, family members and others. Thanks to all. I have the original credentials but after the Hard reset Samsung SM-T580 will nit get past FRP lock! In my Vivo Y28 the Build Number is not there. What should I do? now u r a Developer. sir i have micromax unite 3 smartphone ,i want to update my phone ,how is this possible i have no idea . give me some tricks . What is the benifit of usb debugging. My phn problem is starting sturcked it shows micromax canvas turbomini symbol strucked..
Micromax A110 Cavas 2 support OTG by Jelly Bean Stock Rom and you can use USB drive on your phone by OTG cabble. If you are using My Knox, you cannot enable USB debugging mode while the container is installed. First of all enable developer option then you can find USB debugging in the developer option. Don’t try it, because baseband are changed. If you do these steps on right way then you can find usb debugging option under developer option in the system setting. open your phone setting and tap on About phone tab, look for Build number tab and tap on it 5-10 times. sir i had tried on micromax canvas 2+ but i can’t find the option of android debugging. what can i do? Really useful. But: how to disable developer options on SM-A300M? I would like to supress it from Config menu. Thanks in advance. I m irfan Shaikh . I have micromax aq5001 . So not showing Android debugging in my phone so what should I do..? How to root my micromax bolt q335 ?? Pls help me sir….its urgent..
i have mmx unite 2 – A106 mobile. i have deleted my stock android system recovery , so there is no recovery, is there any recovery for my cell ??!! How to update My Micromax Nitro 2 E311 to Lollipop? Is update available for my Micromax Nitro 2 E311? Enable developer option then open it and scroll, you will find USB debugging on it. Micromax did not release Lollipop for Micromax canvas juice a77. If it will release then you will find lollipop Rom with guide here. i’ve micromax canvas knight cameo a290. i unroot my device. and now i want to upgrade 4.4.2 to 5.0 . so, what should i do? please help me. Micromax did not release Lollipop for micromax canvas knight cameo a290. If it will release then you will find lollipop Rom with guide here. I don’t suggest you any custom Rom because custom Rom means, Beginning of troubles in your phone. You are amazing man. Keep it up. Solved a big problem of mine. Had searched everywhere, being a novice. Thanks a lot. hi. maine apna micromax a106 ko update kiya h uke bad se mobile mai dono hi sim k signel nhi aa rhe h.. aur mai koi call bhi nhi kr pa rhe hu but wo sim detected kr rha h what to do…??? muje canvas a88 ka rom Chenge krna he so please help mi sir ….